Why is Oak So Important? Responding to this question is a difficult task since oaks are important for so many reasons, and there are valid concerns about their future. I will share just a few examples of the importance of oaks for wildlife and the forest products industry in this article. This quote from William McShea and William Healy (2002) sums up the importance of oak for wildlife: “Acorns are the most important wildlife food in the deciduous forests of North America, the ecological equivalent of manna from heaven.” Acorns are a high-energy food source that stores well. As a result, they are a key food source that helps wildlife populations survive winter when food supplies are most limited. More than 90 wildlife species from songbirds and small rodents to white-tailed deer and black bear use acorns. Even animals that do not directly consume acorns can be positively affected by oaks. Some of these relationships are obvious, for example, many of the small mammals that carnivores (like bobcats) feed on have a diet of acorns. While others are not as obvious. For example, ponds and vernal pools with oak leaf litter produce more and larger wood frog tadpoles and salamanders than those with mostly maple litter. The wood from oaks is used in many applications, but most people think of flooring, cabinetry and furniture. 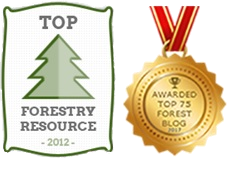 The most recent data from the U.S. Forest service shows that 25% of the volume of wood harvested in Pennsylvania comes from oaks (Forest Inventory and Analysis 2016). Additionally, a huge percentage of the lumber consumed in the Amish Furniture industry is oak. One historic use of white oak is cooperage (barrels). White oak barrels have had many uses, but there has been a recent resurgence in demand for use in the wine and spirits industry which has resulted in an increased demand for white oak lumber. Oak/Hickory. Although oaks dominate the upper canopy of much of our forests, there is a serious lack of smaller oak seedlings, saplings and pole sized (4-10 inches diameter) trees to replace them. Instead, the trees getting established under the oak canopies are mostly red maple, black birch, sugar maple, and blackgum. In fact, understory abundance of species like red maple, American beech, blackgum, striped maple, and black birch is increasing. When forests are disturbed, either by natural or human-caused events, the existing understory species have the potential to change the composition of the next forest. In fact, the volume of maples (red and sugar combined) has increased to the point that they are nearly equal to red oak. Oaks are a bit like Goldie Locks. 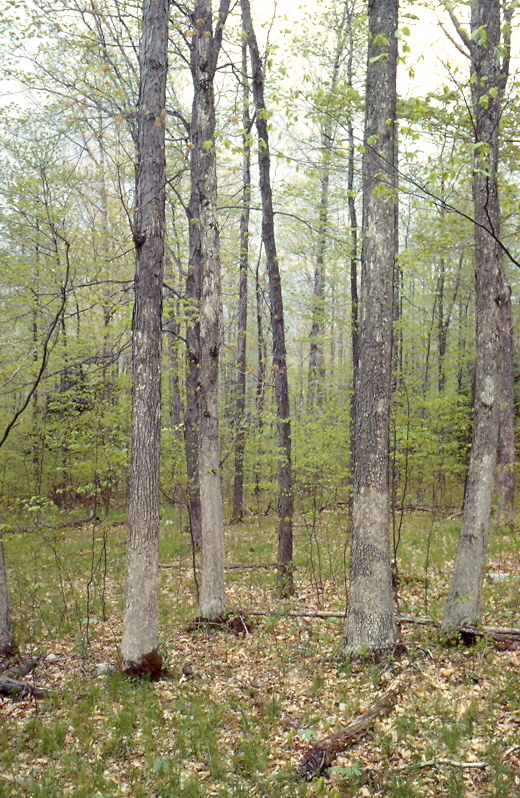 Too much light from heavy cutting (clear cutting) and they often lose the battle to sun loving species like yellow poplar, aspen, and black cherry; too little light from no cutting or light cutting (select cutting) and they lose to shade loving species like red and sugar maple, blackgum, and black birch. However, when young oak seedlings receive just the right amount of light they can invest much of their energy into the development of large carrot-like roots. These roots give them the ability to sprout and grow rapidly following disturbances like fire, wind throw events, and timber harvesting. In addition to light, browsing by deer also has a significant impact on the presence of oak seedlings in forest understories. Deer have taste preferences; some trees, like oak, are highly preferred while others are hardly touched. By selectively browsing oak, deer have the ability to eliminate it from forest understories. Research has shown that when deer population densities exceed what the land can support oak regeneration suffers. In regions of the state where decades of overbrowsing have severely depleted the habitat, even relatively few deer can have significant effects. The Northern Research Station of the U.S. Forest Service and Penn State University have been conducting oak research for more than 20 years. The focus of the research has been on regenerating and sustaining oak forests. In a nut shell what they are finding is that eliminating much of the mid and understory poles and saplings (mostly red maple, striped maple, black birch, and blackgum) with herbicides (or fire) is not enough for oak seedlings to become established. 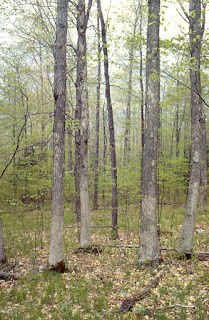 However, when combined with a harvest that allows the proper amount of light to reach the forest floor (i.e. shelterwood harvest) and deer reduction or fencing, oaks can be successfully established on many sites. 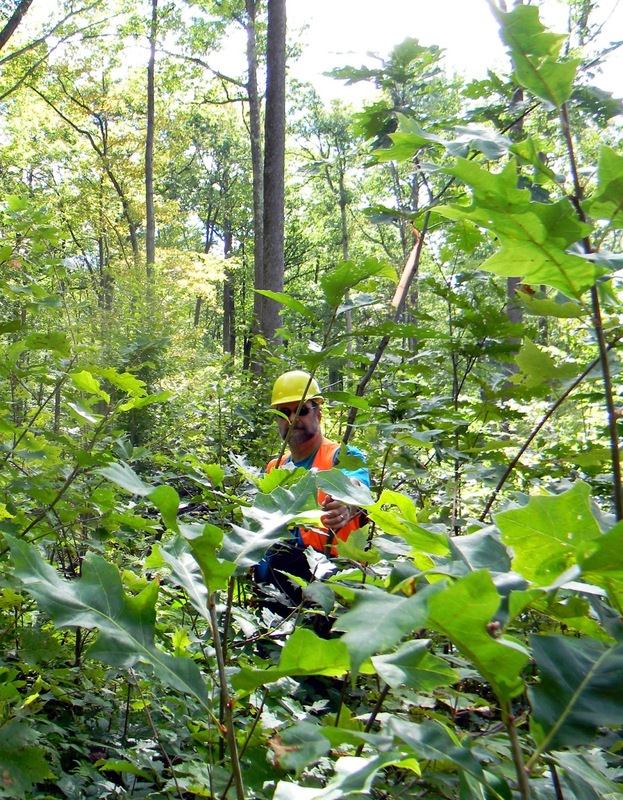 These practices are currently being employed on public lands across Pennsylvania; however, they are rarely employed on private woodlands, which make up nearly 70% of Pennsylvania’s forests. In 2017 the PA Natural Resource Conservation Service (NRCS) and the Allegheny National Forest received funds for the 1st year of a 3 year project to improve and protect the health and resiliency of Oak ecosystems in North-Central Pennsylvania. 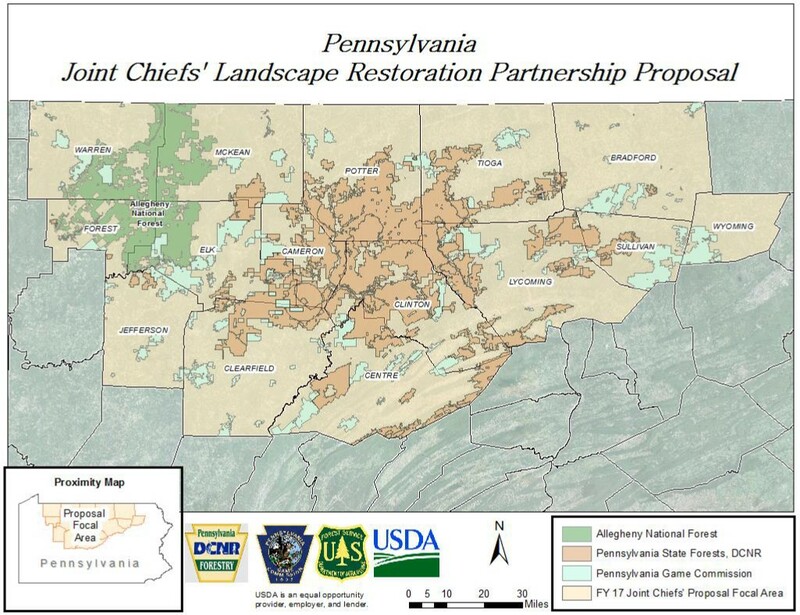 The project, entitled “Sustaining Pennsylvania’s Oak Ecosystems through Partnership in Forest Management,” covers a 15 county area in North Central Pennsylvania. The project is a partnership between NRCS, the Allegheny National Forest, the Pennsylvania Game Commission, and the Pennsylvania Department of Conservation and Natural Resources Bureau of Forestry. The collaboration will help public and private forest landowners maintain a diversity of forest age classes and species to sustain forest ecosystems that are resilient to stressors. For additional information contact your local service center. The future of oak is in your hands! 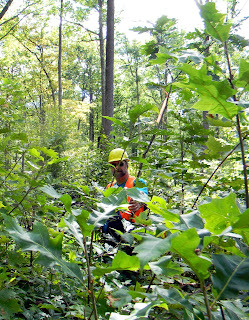 If you would like to enhance oaks in your woods be sure to contact your DCNR Bureau of Forestry Service Forester or a Penn State Extension Forestry Educator to get assistance. Oaks were here in the past, and they're here now. Help us to make sure that they are here in the future. Are we trying to perpetuate an oak forest that was "artificially" created by human activities? From the heavy logging of the late 19th and early 20th Centuries and the fires that followed, thru the extreme reduction of the deer herd at the same time and elimination of American chestnut by an introduced fungus, all the conditions that promoted creation of the oak forests we see today were caused by human activities. Today's oak forests aren't much more "natural" than a plantation. How much time, effort and funding are we willing to expend to perpetuate a forest that was created by conditions that we cannot replicate -- or if we can it will only be by expenditures that cannot be sustained. I agree with the previous comment as far as how the Oak Forest became as prominent as it is. However, how it got here is immaterial. If we want to enjoy the same benefits to wildlife that we have historically had, active management to insure oak regeneration will have to happen. We really can't afford to let "nature take it's course". If all the other forest components were safe and in place, the situation would be a little easier, but we have HWA,EAB, Beech Bark scale disease, and the list goes on. Beechnuts are about the only other high volume mast crop that can occasionally substitue for the oak mast crop. Like it or not doing nothing is only going to make the situation worse. I would have to agree. We may have a greater area covered by oak forests now than we historically may have had but there is no discounting the fact that oaks play an extremely important role in the ecosystem as well as the industry. I also believe that oaks have always been a major forest component on our poorer growing sites. A real key to getting oak in the next forest is being able to accumulate oak seedlings and have then well established in the understory before any type of disturbance takes place. Accumulating oak seedlings over decades is a real challenge with the competing vegetation and deer issues we are currently dealing with. Oaks were a major genera in central PA forests before European settlement (Abrams and Ruffner 1995), events of the late 1800s and early 1900s did increase their dominance, and current conditions are leading to a reduction of that dominance to below what was the pre-settlement level. To put in numbers, 40% oak became 65% oak and now it’s headed to 20% oak. Whether or not the amount of oak capable of being created/sustained by current conditions is what we want is for each forester and forest landowner to decide and part of that decision is the cost question. How much oak can we afford? it seems to me, in western mountain range of SW PA, years of acidic precipitation have altered the ph balance and combined with the prolific fern growth has choked out the coppice growth from the oak stumps after harvests. That’s the question for all foresters these days. What are we trying to hold to in the face of threats – do we fight to keep black cherry in the northern tier, knowing its success was an artifact of human influence (acid deposition). And no one will agree on the point at which we hold the line. Oaks are important because we lost the chestnut and they filled the void for mast. Forest product demands change. We could make this argument about all forests. We can’t take people out of the forestry equation. And where to hold the line is a values-based proposition.